This may decrease as development continues, but it will not increase. Based on street fighting in the 1920 & 1930s, several outfits vie for control of the Chicago Streets. There is a large sway towards the Chicago Outfit as present, but that pay change as gameplay is discussed and developed. No doubt several people will have ideas on this one. Last edited by cairnswk on Thu Feb 28, 2008 12:27 pm, edited 33 times in total. Do you need to hold all of that colour to get the bonus or just the gangsters? If it's all of the the colour then ..
what are your thoughts on majority control bonuses here? at least on some of the larger areas I mean. I say this only because it looks like quite a few of these bonuses will only be held towards the end of the game. Maybe it's a bad idea. I don't know. If it's only the gangsters then a lot of these other territories you have a useless. It's probably the whole colour because what is the reason for the colours on these other territories! Anyway, that's all I have for now. Let me know about this question then I'll come back with more feedback. edbeard wrote: Do you need to hold all of that colour to get the bonus or just the gangsters? If it's all of the the colour then .. Yes edbeard...i am quite open to majority control bonuses, if that will create better gameplay. Let me know more of your thoughts on this subject. 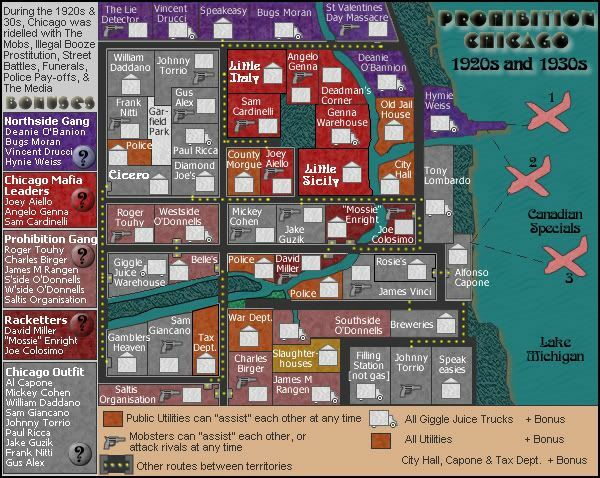 This map feels a little too bright, colorful, and pleasantly sugared to be about gangs in the 1920's. 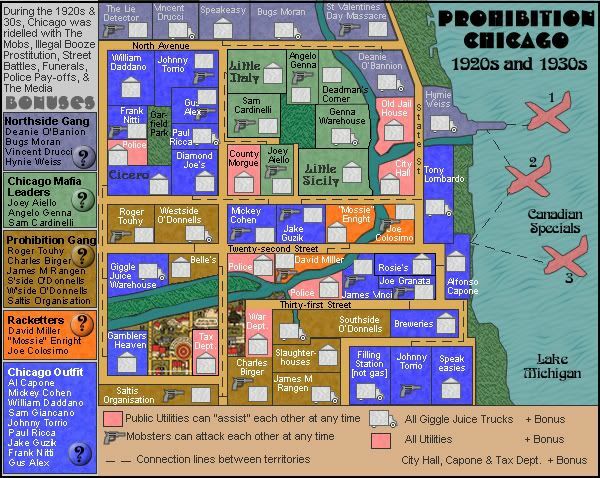 AndyDufresne wrote: This map feels a little too bright, colorful, and pleasantly sugared to be about gangs in the 1920's. Thanks Andy...i'll change it to Sin City colours LOL....early days yet! No thanks... I'd rather like to see a map of Philadelphia. Not sure the planes fit too well. Do you get a bonus to hold the 3 planes? Can you cross the river? The connection lines are very hard to follow along the streets. Whats that strange pattern and target towards the bottom left (tax dept)? Kinda neat. I like the giggle juice trucks & gun graphics. I like how the the gangsters names make up the territories. Nice start Cairns. I'm sure you'll adjust colors as the map progresses. "Mobsters can attack each other at any time"
That seems awkward, shouldn't it be bombard? It doesn't seem right that attacking each other leads to a take over. I like the assist terminology better. Maybe mobsters of the same gang could assist each other too, but rival mobsters bombard. You'd need to change the layout if you did this, as I get that right now mobsters attacking each other is a big way to move around the map and some places aren't connected if you change it. why planes? majority of booze came on boats. the ships would land at canada, buy the beer and stuff, then leave with their official destination in Cuba lol. they were the fastest ships in the world! hope so a-person1192...thanks for dropping by. RjBeals wrote: Not sure the planes fit too well. Do you get a bonus to hold the 3 planes? Can you cross the river? The connection lines are very hard to follow along the streets. Whats that strange pattern and target towards the bottom left (tax dept)? Kinda neat. I like the giggle juice trucks & gun graphics. I like how the the gangsters names make up the territories. Nice start Cairns. I'm sure you'll adjust colors as the map progresses. yesh thanks Rj....long way to go! * apparently i didin't complete some parts of the map. Coleman wrote: This rocks my socks. Well, i don't know about bombard. Noramally gangsters would want to kill rival gang members to take over their territories wouldn't they. mobsters of smae gangs could "assist" each other, very possible. yes that the way of moving around the map.....streets (as we found out with sydney) aren't exactly the best carriageway for players to move. I am not in favour of changing the layout, unless this one is completely useless. Thanks for the comments though Coleman. Herakilla wrote: why planes? majority of booze came on boats. the ships would land at canada, buy the beer and stuff, then leave with their official destination in Cuba lol. they were the fastest ships in the world! Planes are used because it was on the mpa that i took it from. mibi wrote: What about Bugsy Siegal? 2. Beginnings of new connectors...note indentations in city blocks for the connections. 3. Altering of Capone Terts. Wiki says he was only an associate....and made more of name for himself in California and Las Vegas, later in 1947? Mickey Cohen was Bugsy's leutentant and back by the Chicago Outfit. Cohen took over after Bugsy was... wacked. I am reluctant to put him in, because he had more of a Brooklyn connection. However, if you insist, who do we take out to replace him with. I really don't think he had as big a role in Chicago as the other. Can you point to your references to convince me, mibi. Maybe instead of just the Chicago connection, you make it into the east chicago and west chicago connections. Right now it is 20 territories. Who the hell is going to hold all of that? 10 and 10 makes sense to me. edbeard wrote: Maybe instead of just the Chicago connection, you make it into the east chicago and west chicago connections. Yeah....that works for me edbeard....good suggestion!...providing there is no other objections to it. what if you held the majority of Leaders for a certain gang and you get a bonus. 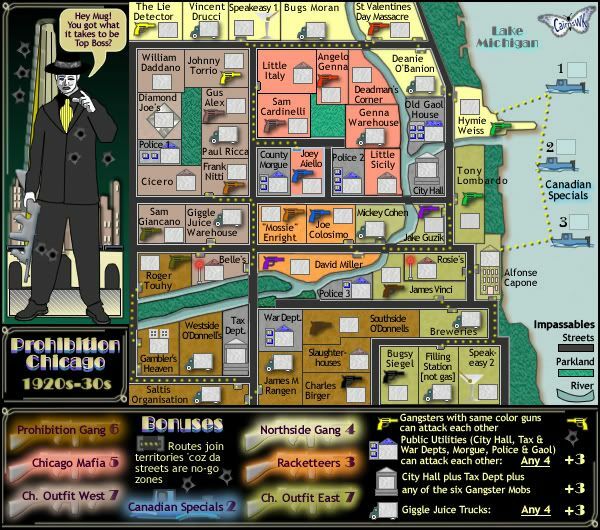 Maybe for the chicago mafia it would be quite small +1 since it's only two territories, but that could be something. are you talking about say 2 out of 4 best of + 2 situation?